I grew up on a farm near Wakool not far from the Murray River in the south west Riverina. It was an irrigation farm. Dad and mum grew rice and ran sheep. In the fifties and sixties the area around the Wakool district was overwhelmingly Anglo-Saxon. However, at Tullakool we had some Italian neighbours, also farmers. We kids used to go into the school at the nearby town of Barham on the bus. Our Italian neighbours’ farm faced a lane along which we rode our bikes to the bus stop. They grew vegetables and flowers in front of their house. 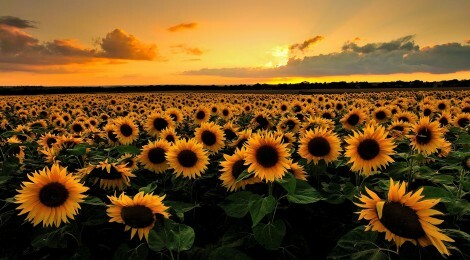 I think it was the first time in my life that I saw a row of sunflowers. Even as a young child I was conscious of how the flowers moved from the time I got on the bus in the morning till the time that I got off the bus in the afternoon after school. I thought that their size and colour and the way they moved was amazing. However, it was to be practically a life time later that I was to learn the Italian word for sunflower – girasole, which literally means something like turns with the sun – ‘sun turner’. It is a beautiful word and so easy to remember, and brings back childhood memories. I think learning the word for sunflower epitomised for me one of the truly pleasurable things about learning a language, that is, obtaining a real appreciation of the way in which often quite beautiful and visual words come to be constructed. That is something I was not really aware of as a child when I learned so many English words. They were just words that you came to know unconsciously. But the process of learning Italian has really opened my eyes to this delightful aspect of language. How vivid and beautiful are even commonplace words like ‘portavoce’ (spokesman) and ‘capolavoro’ (masterpiece)! It is really one of the things that keeps me persevering with learning Italian.